The 19th annual Bloor West Village Toronto Ukrainian Festival in 2015 runs from September 18 to 20 on Bloor Street West between Jane and Runnymede TTC stations. 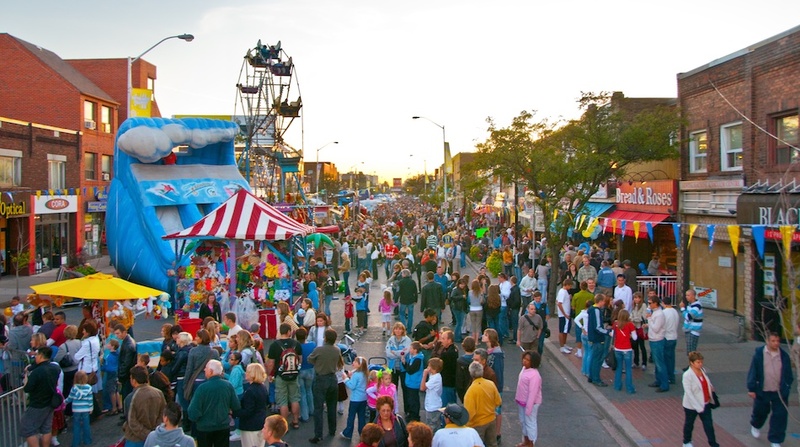 It’s so popular it was named one of the “Top 100 Festivals or Events in Ontario” for 2013, 2014 and 2015. Discover Ukrainian culture in Canada and share the Ukrainian spirit at North America’s largest Ukrainian Street Festival. This is your opportunity to experience Ukrainian culture and hospitality at its best. Enjoy non-stop entertainment with Ukrainian performers from the Greater Toronto Area, Canada, the USA and Ukraine, including dancers, vocalists, musicians and a special youth segment. Two stages will feature non-stop entertainment. And if you wish – join the dancing at the evening zabava/street dance on Friday and Saturday. Vendor kiosks will offer delicious, authentic Ukrainian food and beverages, beautiful crafts and collectibles. Cultural pavilions will feature interactive cultural activities and displays of historical and contemporary interest. Enjoy shopping at the sidewalk sale by local Bloor West Village shops and businesses. Take in the colourful parade on Saturday morning at 11 a.m., the film festival, the art exhibit, and have fun at the midway. Learn to Ukrainian Dance … Drop by the Community Stage at Runnymede and learn dance steps from the Desna Ukrainian Dance Company. You’ll be dancing like a pro in no time. Eat Perogies … and cabbage rolls, borscht, kobasa, pampushky (Ukrainian donuts) and more. Make sure to try a Pegroll … a Ukrainian spring roll filled with delicious potato-cheese filling. Yum! Watch the OMNI Parade … The annual Festival parade winds its way along Bloor Street West on Saturday, September 19 starting at 11:00 a.m. See marching bands, floats, dancers, even your favourite politician. Shop … Discover the intricate and colourful creations of Ukrainian artists and craftspeople including embroidered clothing, pysanky (Ukrainian Easter eggs), greeting cards and ceramics. Check out locally harvested products like garlic and honey. Take in a Movie, or Six … Film Day runs from 10:00 a.m. to 6:00 p.m. on Saturday, September 19 at the Runnymede Branch of the Toronto Public Library. You can even talk to movie directors. See the LINEUP. Be Entertained … Listen to bands and musicians from across North America, Ukraine and Europe on the Northland Power Festival Stage. Be awed by colourful and acrobatic Ukrainian dancing. Feel free to dance and sing along. View the PERFORMERS. Shop Some More … Browse the annual Bloor West Village BIA sidewalk sale and search for bargains, buy gifts or find that special can’t-live-without-it item. Go to the Midway … Give the kids (or yourself) a thrill on the midway rides and rock-climbing wall. Get Schooled … Learn about Ukrainian culture and history. Get the latest updates from community organizations. Meet merchants offering services to the community. Rehydrate … Make sure to take a break and re-energize in the Refreshment Garden with a cold Ukrainian beer or your favourite non-alcoholic beverage. Socialize … Meet old friends, make new ones or fall in love under the stars at the street dance. You won’t be the first.